← Skye Sculpture at Sligachan for Mackenzie and Collie pioneers of the Skye mountains. Memories of dry rock or is it just a dream? Squareface a Cairngorm Classic. The magestic Squarface on Beinn A, Bhuird in the Cairngorms, a Cairngorm Gem! As usual I had some plans for this summer, then it rained and rained, just to get into some of the remoter cliffs,take time and climb some classics before I get too old. 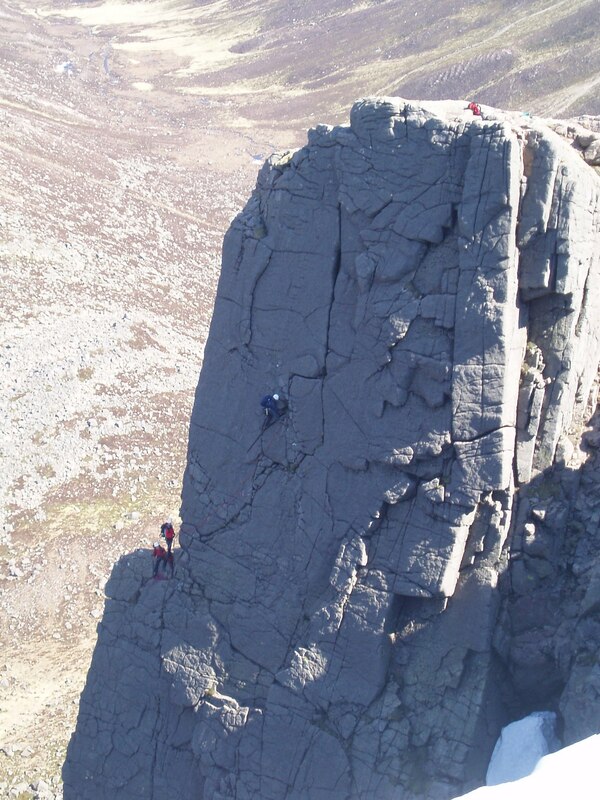 Climbs like the incredible Squareface a 90 metre Very Difficult route given a 4 star grade by the guidebook authors. It is an great line and I have been lucky to climb it on four occasions. What a place of beauty is this Garbh Coire, a huge Cairngorm corrie with so many routes many on solid granite. It gives great climbing up grooves and cracks in an airy situation and has incredibly has remarkable but low technical climbing. Just getting into the Coire is an adventure but with the use of mountain bikes it is a lot easier now. From Invercauld it is a 15 k walk or cycle to the crag but well worth it. It is of course a Tom Patey route climbed in 1953 and can be combined with another classic Mitre Ridge in one long day. I feel it is far better not to rush these routes and go for a couple of days and enjoy the solitude and wildness of this incredible corrie. The “secret howf “is here but I cannot tell you where it is a secret,have fun finding it. In the corrie floor there are boulders and great camp-sites where you can watch the wild life after a day out. I have had such fun in this place, it is a great big boots route in a huge mountain atmosphere and rarely busy. When I went once with the dog he arrived up at the first pitch after getting bored in the Corrie and worked his way up the gully until the cornice stopped him. We were horrified as he turned round and headed back down knocking loose rocks which cascaded over the cliffs, some dog. There is a great description in Classic Rock of these climbs and to sit on the summit after a long day in this corrie is indeed one of life’s pleasures. In winter this Corrie is incredible and has so much potential, in my youth I managed a drop of by Sea King with some of my Buchan Mountaineering Club Friends. This is the way to travel – Mitre Ridge the other classic in the area is one incredible climb in winter and this climb is a serious place to be if anything goes wrong. The huge plateau with massive cornices is not a place to be complacent and one has to work hard in poor weather to get off the hill safely.On that helicopter day 5 of us all on climbed a grade 3 in the Garbh Corrie. It was incredible no one else about and rock hard snow and ice, blue skies and bitter cold. Unfortunately the walk out to Invercauld was in deep snow and we got off at 0300 in the morning at the end of huge day, no helicopter lift out but what a day. When I was at Leuchars we used the track, and could get wagons on the summit. The track is no longer there but we used it on rescues as access to the Plateau. We once lost a wagon for half an hour in a white out! 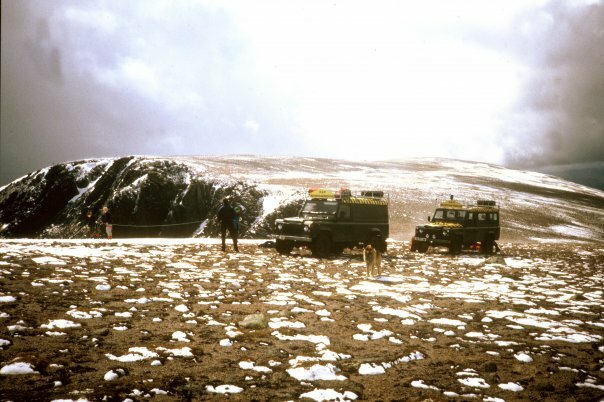 I remember telling a well-known Aberdeen climber who was soloing on Mitre Ridge in wild weather that he could use the wagon for shelter on the way off. He thought we were kidding and we found him asleep in the wagon with my dog. We gave him a lift back to Invercauld, great days. This entry was posted in Enviroment, Friends, Mountaineering, Rock Climbing. Bookmark the permalink. 2 Responses to Memories of dry rock or is it just a dream? Squareface a Cairngorm Classic. 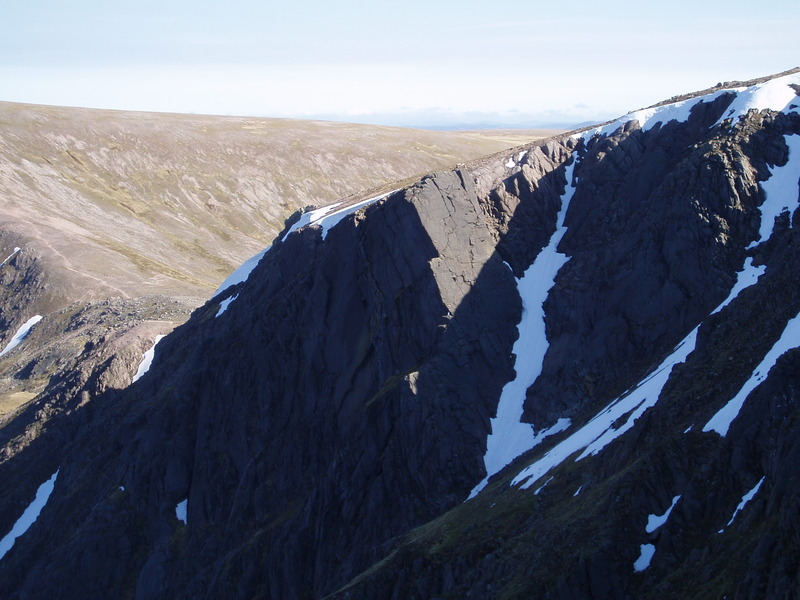 Early in 1954, Tom Patey persuaded a group of Lairig Club dilettantes (University of Aberdeen Climbing Club) to follow him up his new route “Squareface”. The group included Ken Grassick, Graeme Nicol, Gogs Leslie, Gordon Lillie and about six others. I was on the end of the group in sneakers, and found its grade of “v. diff” fully justified. Thanks Peter – it must have been a wonderful period to climb in, especially with the basic equipment, great days. What a climb to be part off with some of the great names of this period.